Every year around this time (autumn) I start to crave oatmeal raisin baked goods. Yes I know it's a little odd, and I'm not sure why I crave these in the fall, but I do. So, here's a recipe I came up with a few weeks ago that definitely feeds my cravings! 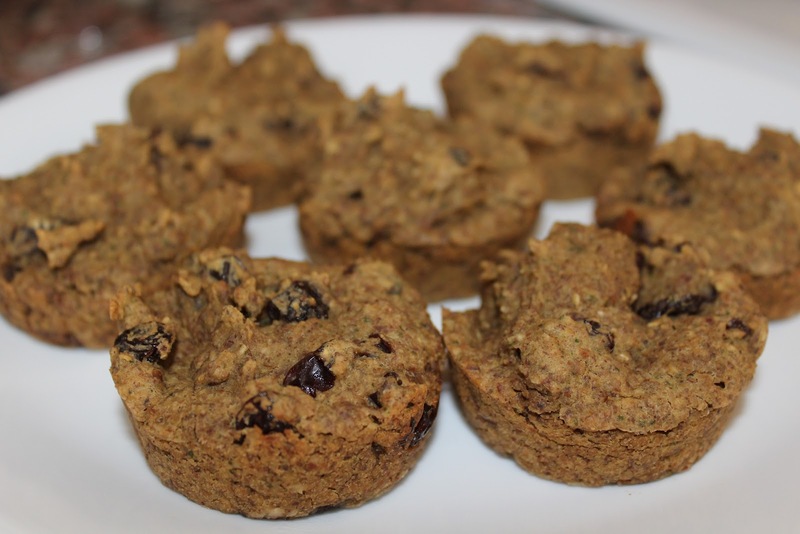 These are gluten free and filled with nutrient filled foods like organic spinach and flax meal. These are for little one's 10+ months who are ready for finger food and Mommies and Daddies of all ages. Preheat oven to 350F. Mix everything but raisins in a food processor and blend until smooth. Add raisins and stir. Spray muffin pan with cooking spray. Scoop batter into pan (about 2 spoonfuls per slot). Cook for 15 to 20 minutes or until a toothpick that you stick in muffin comes out clean. Let cool and enjoy!